Southampton, PA — AdvantaPure will showcase its molded manifolds and components, single use items, high purity tubing, and process hoses at several pharmaceutical and bioprocess events during the spring of 2013. Each show will offer the kind of personal contact that allows customers and suppliers to discuss their processes, products, and plans. This will be AdvantaPure’s first appearance at BioPharma Asia. Scheduled to take place at Resorts World Sentosa in Singapore, BioPharma Asia is in its sixth year and in 2012 hosted over 4,000 attendees and supplier representatives. The region is an important bioprocess and pharmaceutical manufacturing area, and AdvantaPure is eager to connect with potential distributors for its high purity products. AdvantaPure is also making its first major appearance at TechnoPharm. This event is held every 18 months and takes place at Exhibition Centre Nuremberg. Over 300 companies from 16 countries exhibited at the previous show. TechnoPharm 2013 will focus on clean room technology as well as other disciplines of the pharmaceutical industry. AdvantaPure will be supported at the show by its local distributor, Tecno Plast of Düsseldorf. At each show AdvantaPure will feature its single use molded manifold assemblies for batch filling and sampling. 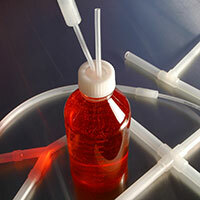 The assemblies are ISO-certified, Class 7 clean room molded from AdvantaFlex® biopharmaceutical grade TPE (thermoplastic elastomer) or silicone and incorporate tubing with molded fitting connections such as wyes, tees, crosses, reducers, and hygienic union clamps (commonly known as Tri-Clamps®). The molded connections provide a smooth inner surface for even, unrestricted fluid flow and eliminate many barbed fittings, thereby reducing the risk of a wasted batch of costly pharmaceutical product due to fitting leakage. The single use process systems also reduce cross contamination risks, simplify cleaning validations, increase production time, and reduce costs. Other products to be displayed include flexible process hoses of silicone, fluoropolymer, and rubber; sanitary stainless steel fittings; hose identification solutions; and molded BioClosure® container closures for vessels of glass, plastic, and metal. AdvantaPure has appearances scheduled for the fall as well that include BioProcess International in September and China Pharm and ISPE Boston in October. For more information on AdvantaPure’s products or its trade show appearances, contact the AdvantaPure team at 145 James Way, Southampton, PA 18966; phone 888-755-4370 or 215-526-2151; fax 888-258-4293 or 215-526-2167; e-mail: sales@advantapure.com.